In 2010 Universal Display announced a new AMOLED display architecture called RGB1B2 that uses two blue sub-pixels - a fluorescent deep-blue and a phosphorescent light blue. 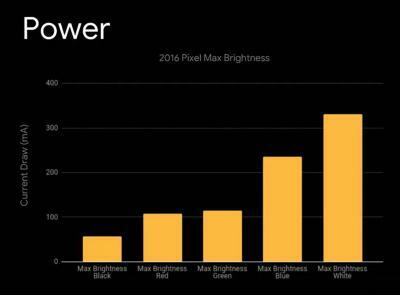 The introduction of a light blue sub-pixel can significantly extend the operational lifetime of an OLED display and reduce the display's power consumption by as much as 33%. 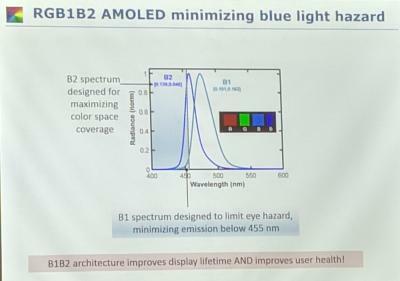 The RGB1B2 was never adopted (one of the reasons is that adding another sub pixel complicates the TFT backplane and has other disadvantages - but the architecture is now again on the table and UDC presented it again at OLED Korea 2019. In June 2018 Kyulux and Wisechip unveiled a PMOLED display that uses Kyulux’s Hyperfluorescence yellow emitter. Kyulux updated today that Wisechip is now ready to start producing the HF panel and is seeking customers. Wisechip eventually settled on a large panel - 73.00 x 41.86 mm (2.7") with a resolution of 128x64. Wisechip says that the power consumption of its HF display is almost half of its regular fluorescent yellow PMOLED. The Washington Post's Geoffrey A. Fowler posted an interesting article in which he details how new smartphones are under-performing older ones in terms of battery life. 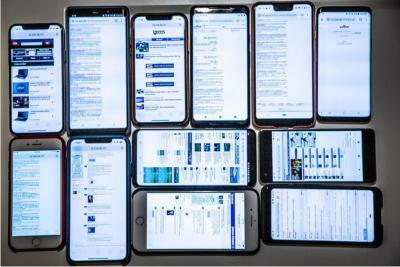 Geoffrey puts 12 smartphones to the same test, and checks which ones dies first. It is interesting that the new 2018 smartphones under performs similar smartphones released in 2017. Geoffrey's conclusion is that new display technology - high resolution OLEDs, are the culprit. The main reasoning behind that is that the iPhone XR (with its LCD display) performs better than the iPhone XS, even though the XR has a smaller display. Researchers from Korea's KAIST research institute developed a high-efficiency OLED architecture that uses external scattering medium to achieve an EQE greater than 50%. Such high EQE was only demonstrated before using complex internal nanostructures or by employing a micro-lens array, but these solutions are complicated to produce and can hinder the OLEDs flexibility and planar structure. The researchers say that their scattering approach maintains the planar geometry , results in flexible OLEDs and can be easily scaled to enable low cost production. Kyulux announced that it has developed a new blue Hyperfluoresence/TADF OLED emitter. Kyulux managed to extend the lifetime of the material and reached 100 hours at LT95 (@ 750 cd/m2) while maintaining a high EQE of 26% - 22% at 1,000 cd/m2. The emission wavelength is 470 nm. Kyulux says that its blue Hyperfluorescence emitter is the world’s top performing material at the moment. Kyulux now aims to work together with OLED panel makers to improve the systems further by optimizing the device structure and the rest of the OLED stack in pilot production lines. Researchers from Japan's Kyushu University developed a new technology called singlet fission that enables near-infrared OLED materials to surpass the 100% limit for exciton production - or achieve an internal quantum efficiency (IQE) of over 100%. 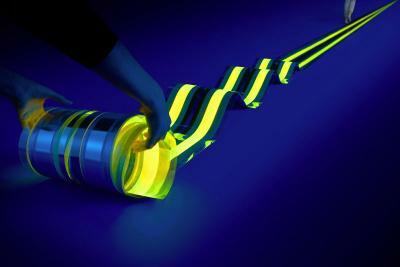 Singlet fission was already used in OPVs, but this is the first time that it was demonstrated with OLEDs. Achieving over 100% is possible because at 100% IQE all charges form excitons that emit light. The new technique splits the energy from a high-energy excitons into two low level ones. The new OLED emitter materials use molecules in which singlets can transfer half of their energy to neighboring molecules while keeping half of the energy for themselves - each singlet creates two triplets. The emitters emit near-infrared light. Researchers from the Universitat Autònoma de Barcelona and TU-Dresden have demonstrated that ultra-stable film formation can be used to to improve the performance of OLED devices. The researchers grew (using evaporation) the organic materials as ultrastable glasses - a growth condition that allows for thermodynamically most stable amorphous solids. Testing four different phosphorescent emitters, the researchers show significant (over 15%) increases of efficiency and operational stability. The researchers also say that these growing conditions are expected to even be more useful for TADF materials.